Today, the Nintendo financial results for the Nine Months Ended September 30th, 2018 were revealed. * games released in more than one region are counted several times (example: 1 game in 3 regions: counted 3 times). Only games released at retail. 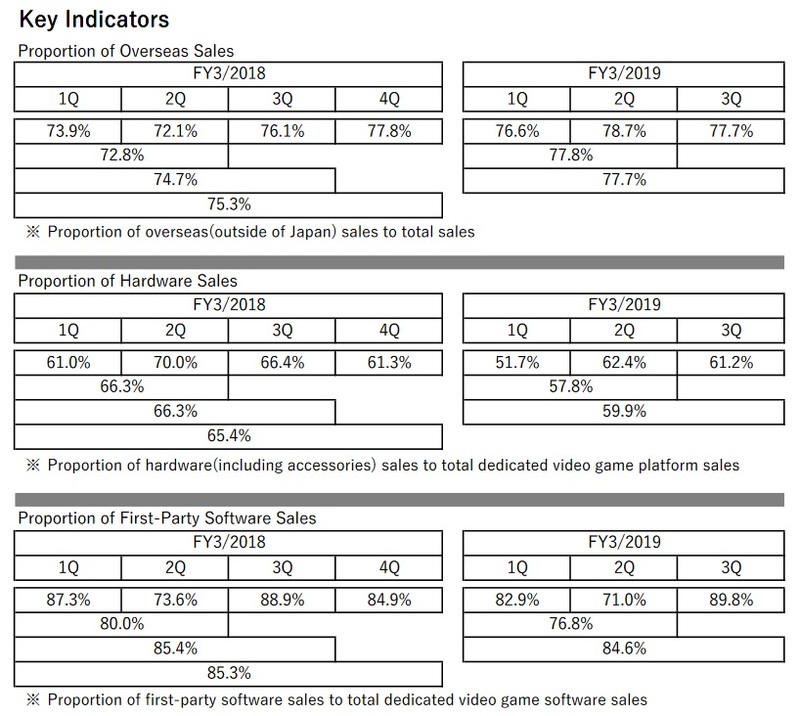 In light of Q3 2018-19 sales, Nintendo decided to revise its sales forecast, but only for the Nintendo 3DS and the Nintendo Switch. For the nine months ended December 31, 2018, three Nintendo Switch titles became major hits with record sales, which helped invigorate the platform. They are Super Mario Party, released in October, at 5.3 million units, Pokémon: Let’s Go, Pikachu! and Pokémon: Let’s Go, Eevee! released in November, at 10 million units, and Super Smash Bros. Ultimate released in December, at 12.08 million units. 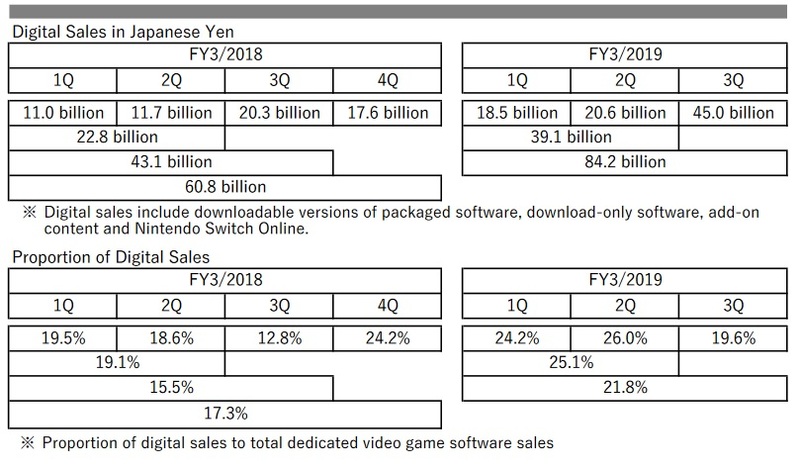 In addition, sales of other titles and titles released by other software publishers continued to grow steadily, bringing the total number of million-seller titles during this period to 20, including the titles of other software publishers. During the holiday season, software was a great driver of hardware sales, resulting in hardware sales of 14.49 million units (19.5% increase on a year-on-year basis) and software sales of 94.64 million units (100.9% increase on a year-on-year basis). 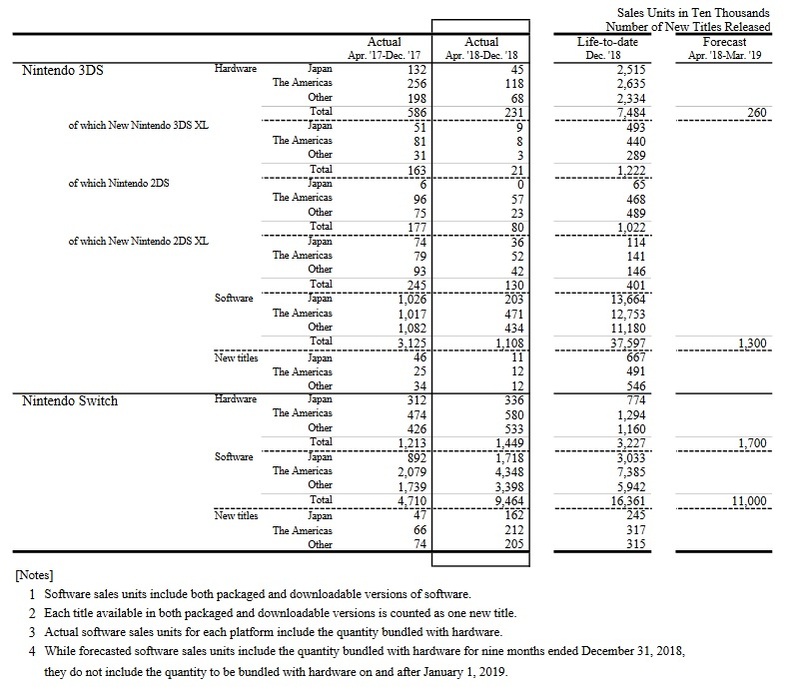 Hardware sales of Nintendo 3DS, now in its 8th year since launch, were 2.31 million units sold (60.5% decrease on a year-on-year basis), while 11.08 million software units were sold (64.5% decrease on a year-on-year basis). Nintendo Entertainment System: NES Classic Edition and Super Nintendo Entertainment System: Super NES Classic Edition recorded total sales of 5.83 million units. For smart devices, many consumers around the world enjoy Dragalia Lost, which was released during this period, in addition to our previously-released titles. Our smart devices, IP related income was 33.3 billion yen (14.7% increase on a year-on-year basis). Major software titles slated for release on Nintendo Switch include New Super Mario Bros. U Deluxe in January and Yoshi’s Crafted World in March, as well as major titles planned by other software publishers. We aim to broaden the platform’s user base by adding new titles and strengthening sales of popular titles already in the market. For Nintendo 3DS, we will continue to leverage the platform’s rich software library and its hardware install base to further expandsales of evergreen titles.